Producer Enzo Capua was first introduced to the talent of Chiara Izzi at a festival in Rome, many years ago. Although envisioning and encouraging a prosperous career for her, Capua had never imagined that he would not only reconvene, but collaborate with his fellow Italian artist years later in New York City. Rounded-out by pianist Kevin Hays and producer Giandomenico Ciaramella – a producer true to his noble spirit and amazing instinct, as admired by Capua – this quartet is the result of two fortuitous encounters which fate had wisely planned over time: that of two musicians so distant and yet so inexorably close, and two producers joined by their visceral passion for the art of sound. 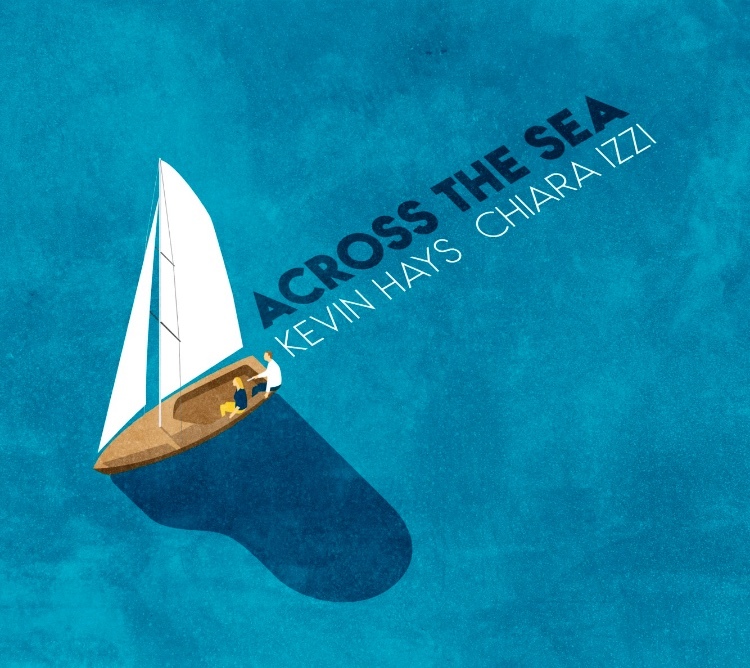 Across the Sea displays an alluring serendipity between Izzi and Hays. As Capua recalls, the synergy between the duo was so lucidly evident during both the creation and recording stages of the album – “so intense is their harmony, so strong the unity of purpose, so rapid is the intuition that these two musicians share”. Hays recognizes Izzi’s sense of sincerity and honesty – “She has an inner strength that I think is rare.” Delivering a vocal that carries a warm, Mediterranean quality, Izzi acknowledges that Kevin’s playing brings out her best assets as a storyteller, singer, musician, and human being. The pair’s compelling predominance of melody, osmosis between vocals and keyboards and the amazing confluence of their singing voices, is eminent on this new album. The French horn in the emblematic “Two for the Road”, the ancestral oud in the classic Davis/Lombardi tune “Tierna Nardis”, the punctual and decisive harmonica on Pat Metheny and Hays’ “James”, the caressing guitar in the Izzi-penned “Circles of the Mind” and the sinuous saxophone in the pair’s original “Viaggio Elegiaco”, are just a few examples of what this converging work has to offer. While each of the compositions of course, have form which the pair respects, the music resembles a live conversation with continuous inputs, which makes the dialogue more interesting, unpredictable and fresh every time. Described by Jazz Times as “a talent to be heard, admired and anticipated”, Chiara Izzi has developed a unique sonic interpretation of a fusion of different genres, including jazz, pop and Mediterranean sounds. Following her international debut performance at the Montreux Jazz Festival Vocal Competition in 2011, at which Quincy Jones awarded her, the vocalist recorded her debut album Motifs (Dot Time Records). “Sister you are very, very talented. You should go to the U.S., Jones encouraged Izzi at this early point in her career. Izzi moved to New York and has since performed at The Blue Note NY, The Iridium, Apollo Theater, Aspen Jazz Festival, Jazzahead, Smalls, as well as the Italian Embassy in Washington DC. She has graced the stage with some of the finest musicians, including Leon Parker, Aaron Goldberg, Bruce Barth, Eliot Zigmund, Warren Wolf, Anthony Wonsey, among many others. The Italian singer has received remarkable appraisals from Quincy Jones, Bobby Watson, Benny Golson, Kevin Hays, Eliot Zigmund, Joel Frahm, Aaron Goldberg, David Kikosky, Greg Hutchinson, Jonathan Kreisberg and Dado Moroni. Derived from liner notes written by Ted Panken.